One of the most beautiful cities in the world, Florence on the banks of the Arno is the home of Michelangelo’s David, of world class Renaissance museums of art and sculpture, lavish palaces and churches, of Gucci and Ferragamo and of Chianti. All of these cost money – the Euros add up when you begin visiting the museums. But budget travelers will be pleased to find that there are still some inexpensive (and even free) things to do in Florence – picturesque walks, some free churches, crowded piazzas with scenic views and plenty of people-watching. Here’s a look at some of the inexpensive ways you can enjoy the city. 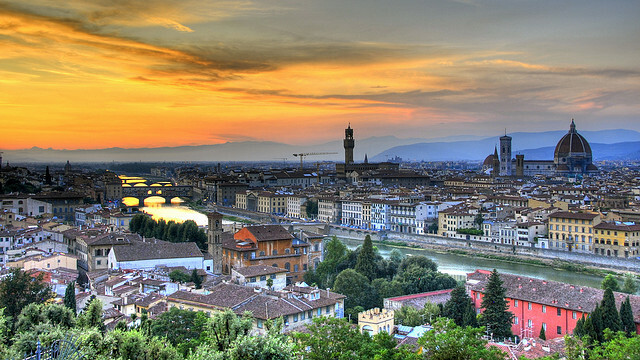 So get some accommodation in florence, strap your walking shoes on, and get to exploring! You do not need to visit the museums to look at art – the city of Florence itself is a masterpiece that you can enjoy on a walk through it. One of the best things to do is to walk along the city. Walk along the historic squares and admire the architecture or walk along the famous and beautiful shop-lined Ponte Vecchio (old bridge) on the Arno, and promenade along the river with a loved one under beautiful antique lamps in the evenings. While Florence cathedral and some of the other important churches in the city charge for entry, there are some beautiful churches you can visit for free. San Miniato al Monte on the southern hills behind Piazzale Michelangelo is a 11th to 13th century church in the Romanesque style with frescoes and a chance to hear Gregorian chants if you go during afternoon service. The Orsanmichele is a granary turned into a church in honor of a miraculous Madonna, whose statue you will find inside in a glass-jeweled tabernacle. The church also has a free museum on the top floor which houses some of the Renaissance sculptures that used to be housed in the outside niches of the church. The Duomo also is free to enter, unless you want to climb to the dome or the adjacent tower, in which case you will have to pay a fee of 10 Euro or so. While the Galleria dell’Accademia where Michelangelo’s David is housed charges 6.5 Euros for entry, you don’t have to pay that much to view the sculpture in the original. Instead, you can simply head to Piazza della Signoria to look at the imitation replacement of the statue that stands in its original location. But there’s more than one David in the city – you’ll find a bronze one at the Piazza Michelangelo. This important 13th century public square is a great place to wander and even catch some free symphonies in concert on some nights. Every way you turn, you will find beautiful relics of Florence’s past – Cellini’s Perseus and the Loggia dei Lanzi, Ammannati’s Fountain of Neptune to name a few. Many of the sculptures on the piazza are imitations, but they are beautiful nevertheless. If you’re a photographer or love to sketch, you can have a great day here. Any kind of shopping will cost you money, but the famous leather markets of the city in San Lorenzo are sights in themselves. Wander around the market and watch artisans at work if you’re lucky, or simply inhale the leathery fragrance while keeping a close watch on your belongings – it’s an area notorious for pickpockets. Another market you can browse is the Mercato Centrale near the leather market. Here you can enjoy the sights and smells of Florentine food markets and even out together a gourmet picnic basket for a fraction of the cost of eating at a restaurant. As you can see, there are plenty you can do on a budget in Florence. Surely some of the best things in the world are truly free!